Printed circuit boards are usually made of fiberglass (FR4), which is highly abrasive and given the many hundreds or thousands of holes on modern circuit boards, requires the use of specialist drill bits. 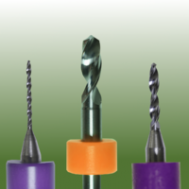 PCB Supplies, supply the highest of quality Drill Bits manufactured by Union Tools. These Drill Bits are made of top quality Tungsten Carbide. This is a UC Series Drill bit. The UC Series bits are and undercut bit which is used for small through holes or via interconnectors, they allow improved inner hole wall quality, whilst maintaining good registration accuracy. This makes them ideal for high density multilayer boards. The mill bits are perfect for milling FR-4 circuit board materials. The mill element is fabricated of solid carbide since carbide is the preferred material for milling glass epoxy circuit board laminates due to its exceptional hardness. The mill life is dependent on a number of factors including feed rate, speed, material characteristics, and what the user considers acceptable mill quality. Due to the brittleness of carbide these mill bits are recommended for use with precision equipment. Care must be taken not to drop or flex them as breakage may occur. All of our bits can be purchased with or without rings. If your require your depth rings to be set at a specific height, or you would like us to use a specific colour of ring please let us know after placing your order.